The Hans Kleinpoppen Symposium on "Complete Scattering Experiments" th was held in honor of Hans Kleinpoppen's 70 birthday. It took place in Il Ciocco, Italy. 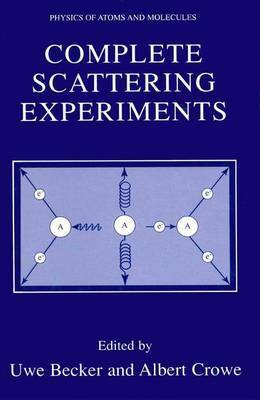 The symposium had two purposes: to present the work that Hans Kleinpoppen has done or initiated during his remarkable scientific career, and to bring people from various fields together who perform complete scattering experiments. Hans Kleinpoppen's work included electron and photon impact experiments which were accompanied by studies of entangled states - a field of high current interest. Representatives from each of these fields gave excellent lectures on their particular subjects, and many discussions that started during the sessions were continued later in the relaxed atmosphere of the Il Ciocco resort. The breathtaking view of the beautiful landscape will be an unforg- table memory to all who participated in this extraordinary scientific event. The coherent and ideal combination of subject, people and location reflected the coherence of Hans Kleinpoppen's aims and activities in science and life. We offer our grateful thanks to all contributers who made this volume such a worthy tribute to Hans Kleinpoppen. We also like to thank Rainer Hentges for the painstaking work to prepare this volume in its complete ready to print version. We are also grateful to the Royal Society of London and the Max- Planck-Gesellschaft who generous support of the Hans Kleinpoppen sym- sium made this marvelous meeting and this proceedings possible.